India and South Africa on Friday announced a three-year strategic programme to expand ties in several key areas such as defence, maritime security and trade and investment after Prime Minister Narendra Modi held extensive talks with South African President Cyril Ramaphosa. The two leaders emphasised on concerted global action to deal with terrorism and called for adoption of the UN Comprehensive Convention on International Terrorism as well as the implementation of the UN Global Counter-Terrorism Strategy in a balanced and integrated manner. The South African president, who arrived in India on Friday morning on a two-day visit, will be chief guest at the Republic Day celebrations on Saturday. Calling India a “strategic partner” of South Africa, Ramaphosa said he was “most honoured” to have been invited for the Republic Day celebrations. 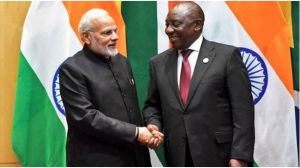 “We reviewed the existing cordial bilateral relations between South Africa and India as encapsulated in strategic partnership, as well as the close cooperation at a number of multilateral groupings that our two countries belong to, where we work closely with one another,” he said in his media statement with Modi by his side. The two countries are part of BRICS, IBSA (India, Brazil, South Africa) Dialogue Forum, Indian Ocean Rim Association (IORA) and G20. This time South Africa participated in the Vibrant Gujarat Summit as a partner country and Indian companies are taking part in efforts to boost investment by President Ramaphosa, the prime minister said. Modi said India and South Africa are partners in skill development efforts and a ‘Skills Institute’ will soon be established in Pretoria.